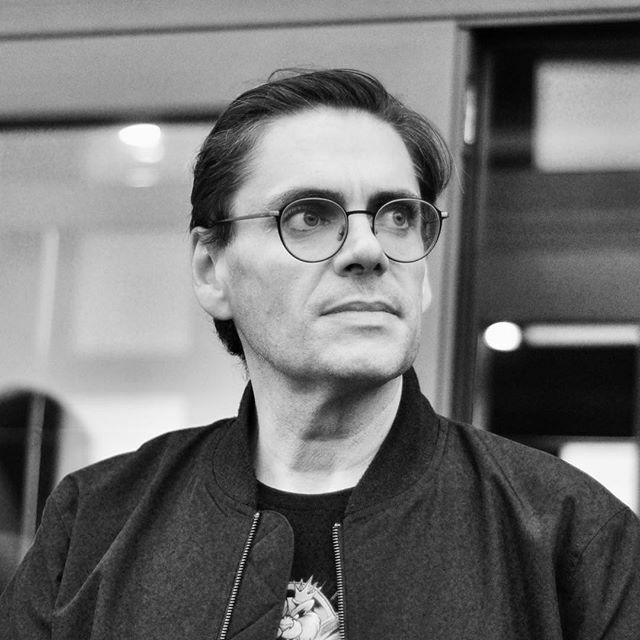 Ive had this watch now for a little over 6 months, I had been looking for a reasonably priced watch that was versatile, different and with a story .. I think I got it with this one! 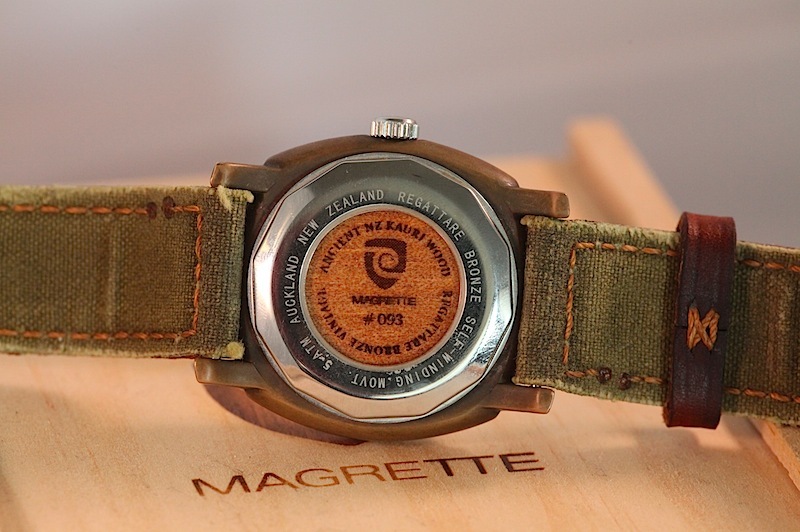 So here goes the story of the watch, between September 2011 and March 2012, the New Zealand watch company “Magrette” sold a special edition watch made out of Bronze and limited to 1000 pieces, compared to the likes of the Panerai Bronzo ‘383′, with it’s price tag of over $40K USD, this one was way WAY cheaper (albeit not quite of the same calibre or mechanism) and of a small but reputable watchmaker, it also had some quirky elements like a window on the back that you would see this New Zealander wood panel with the serial, mine is number #93. It seems this wood (ancient Kauri wood) is a protected species and forbidden to be cut down, you can only pick pieces that have fallen off the tree on it’s own. Unfortunately after they started shipping the watches, somebody did a metal test on the bronze and found out that the metal was NOT bronze but brass instead !! 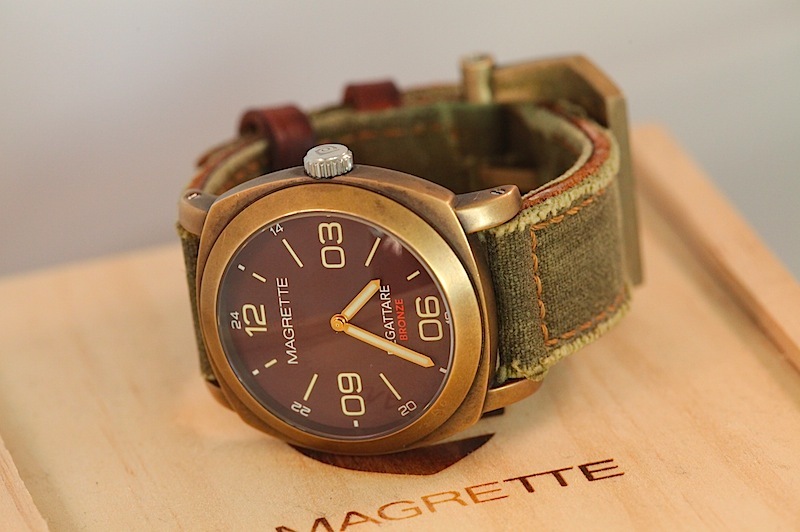 The story goes that the supplier of the alloy sent Magrette the wrong type, and it seems these two alloys are actually quite similar and hard to tell apart unless you do a metallurgical test on them, so immediately Magrette issued a recall of all sold watches and stopped production on any new ones, exactly how many of the proposed 1000 actually went out the door I don’t know. The results of this test show that also our alloy is not the CuSn8 (Copper/Tin) compound referred to as “bronze”, but an alloy of CuZn (Copper/Zinc). This means our cases are made from high quality “brass”, the same material that, for example saxophones and trumpets are made of. 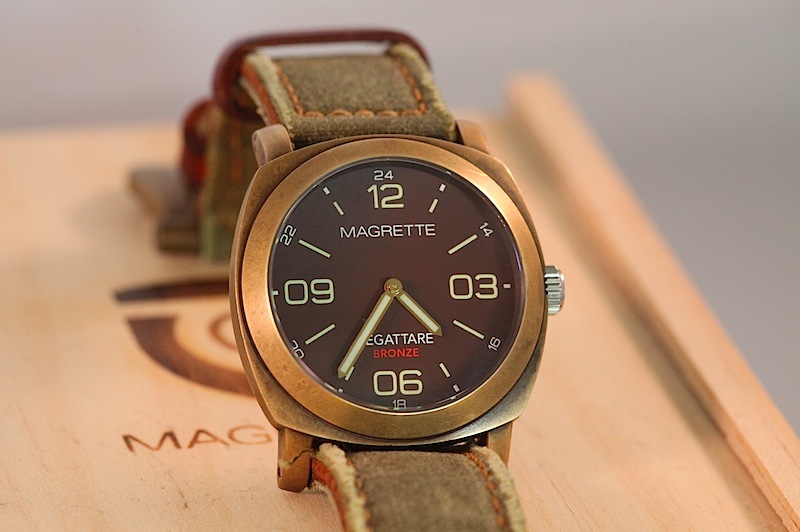 They also offered to swap the current brass case for a bronze one, but that never materialised and Magrette scrapped all plans for a bronze watch (for now anyway). So a few didn’t returned theirs and for some enthusiasts like myself, the idea of owning a “mess-up” like this is awesome, first and foremost Brass is just as good of a material, it’s patina develops slightly more gold than red than bronze, it means the watch will have quite a distinct look, and how often can you wear a watch and tell of such a story ? 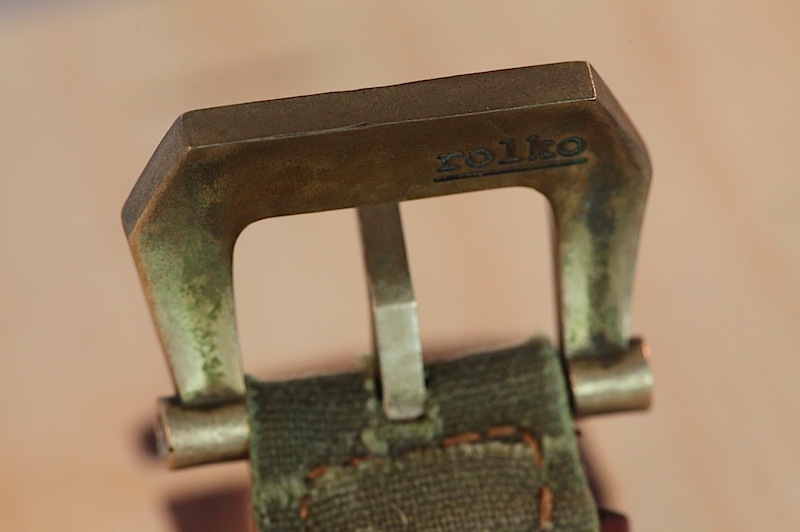 So in the aftermath I was able to snag one for myself from a frustrated owner for a real good price, added to it is a ‘Doneriz Vintage Green Canvas’ strap and a ‘Rolko’ brass (or is it bronze ?) big buckle .. the combo is just stunning. Both the watch and the buckle are showing a real nice patina, giving it an aged but cared look, and of course no two watches will ever be identical because of this process. Once in a while you can still find a few of them out there for a real good price, and they worthy to snag, with this story and time they bound to become only more valuable, but that should not be the reason to own one, having such a cool looking piece and a great story behind it’s the real reward. For now this is my daily wearer, I have 3 other straps and 2 more buckles that I switch around to change it’s look once in a while, but the green canvas remains my favourite.